Khaled is also funny and strong in a way that only gentle people can be. I had seen scenes from his film the year before when we were working with him at the Storydoc workshop in Greece. I remember a mother and daughter who could not see each other due to the wall which now carves right through between the West Bank and Jerusalem, splitting up areas. They were forced to slip photos and letters under it to each other. I remember them touching hands through a gap under the wall. I also remember seeing a boy pushing bread through one of the holes on the wall. What struck me was not the bizarre act itself, but the look on the boy’s face when caught by the camera’s gaze. Maybe I imagined it, but the look seemed to see himself from outside for a split second, acknowledging the weirdness which had transformed everyone’s life in this country of zones and codes and divisions and passes and discriminations and humiliations – and the wall. We had seen it earlier that evening. George Khleifi, a local producer and the organiser of Ramallah.doc, had taken us to see how it lacerated the place in two, cutting through roads to Jerusalem which had been the main roads to see relatives, loved ones, and to travel to work. In the dark we deciphered words which had been written across the top by a South African visiting artist. Ramallah is a big jail. It is worse than we could have imagined. George tells us how the wall came up. He explains it is like experiments done on laboratory animals. You get them used to their new captivity gradually. So the wall started with gaps through which people could pass freely. Bit by bit more was erected until the whole thing was up, making the flow of daily life almost impossible. Of course the situation was already bad for any Palestinian in varying degrees. George told us how he was a 5-star occupied person – meaning his family were in Jerusalem in 1948 so he had an Israeli passport and can travel with more freedom and use the main roads to Tel Aviv. Most Palestinians are not able to use these roads. What happens if they try? I ask the taxi driver the next day. They get shot at. Most of the people on the workshop were 3-star occupied persons – living in Ramallah or the West Bank. Of course the worst situation is for the Gaza inhabitants – George called them minus-two-stars. We saw the check point through which the Palestinians in Ramallah who can travel to Jerusalem for work have to pass through. It is the only way for them to get their much needed jobs. They have to get there at about 2 or 3 in the morning and queue in order to get through the tiny single metal turnstile in time for work the next day. They repeat this every day with little time for sleep or seeing family. We used these turnstiles to get to Jerusalem the next day. Maral Quttieneh, a local producer, gives us a tour. Her family were one of the oldest families in Jerusalem she tells us, they used to own 350 houses. All were taken from them in ‘48. She, though, like George is a 5-star occupied person able to travel from Jerusalem. However, when she was away in Paris studying, after a few years she was warned if she didn’t return, her current home would also be taken from her. She shows us home after home where Palestinians lived, grand homes in leafy areas, now belonging to Israelis. She tells us of families who all over again are being evicted from the homes they moved to after being expelled from their original houses. They now have to make way for new Orthodox Israeli immigrants from Russia and Eastern Europe. It’s spring in Ramallah. In the centre of the town some of the women from the countryside are selling fresh herbs and mint, and boys seem to spin some thin bread out of air. George explains how it was once green, how olive trees were here and an orchard there. Now it is a huge concrete building site made bearable by the good humour and generosity of those living there. George’s own family were Greek Orthodox. He shows us the yellow lights of the ever growing settlements on the hilltops around Ramallah. More walls. More divisions and a huge infrastructure of roads and walls and fences and soldiers to support and protect them. I hear of farmers who can’t get near their land to cultivate it any more, as these settlements or the roads cut them off. I heard of a man who loved to walk in the hills around Ramallah and was shot dead by soldiers. A father of three. The day I head for the airport, the papers report how a group of Jerusalem football fans run amok in a shopping mall climbing all over the chairs and tables, aggressing Palestinian cleaners there, and shouting slogans: “Death to all Arabs”. No-one was arrested. No police stopped them. I imagine these same cleaners must probably have got up at 3 am to get to work. There is no commentary in the paper. I start to feel like the boy who has been caught by Khaled’s camera. The transgressive has become so normalized that we are all stunned and don't respond. Of course what is so shocking in Palestine is not what the Israeli Government does but what the rest of our Governments tacitly endorse. This is the week that America has voted against the UN move even to have an enquiry into the affects of the settlements on the Palestinians. I tell the taxi driver of Khaled’s art project, to stamp passports with Palestinian stamps, and how I wanted to do it last time I saw him but this time on arriving at Tel Aviv airport, was stopped 3 times and questioned so aggressively by Israeli passport officials, that I decided against it. I feel cowardly now and think of the daily hassles my Palestinian friends have. Maral told me how she makes the soldiers who go through all her stuff, put it back exactly as it was. Small triumphs in the face of petty brutality. So what can we do to help you? I ask the taxi driver. Tell people, he said. Tel Aviv airport book shop is full of lovely picture books of Israel and the countryside. I feel I am walking through a vast shared hallucination. I think of the filmmakers I have been working with, of their hushed, insistent need to tell, of the yellow lights of the settlements on the tops of the hills – of the hands touching under the wall, of all the stories which we so need to hear. Emma Davie is a documentary filmmaker and head of the Film & TV department at the Edinburgh College of Art. A consultant with the Scottish Documentary Institute, Emma also is the co-director of the feature-length documentary Breathing, produced by SDI Productions. This blog post first appeared on filmkommentaren.dk. 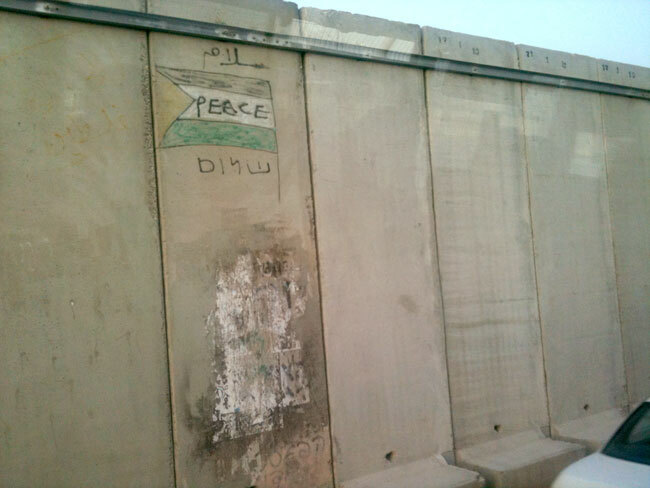 Ramallah: The Freedom To See -- blog post by Emma Davie.